Impatiens flowers top the charts in the 'Continuous flowering' category. Derided by some for being a bit too 'common', impatiens are very useful little plants in the temperate tropical garden. The key when growing impatiens (Busy Lizzies) is to stick to one colour and avoid the pastel (wishy washy) shades. During the first spring rush of bedding plant sales, cheap, mixed colour impatiens fly off the shelves. A couple of weeks later the named colours appear, though slightly more expensive. These are the plants worth seeking out. A good place to find named coloured impatiens flowers (in Britain) are gardening clubs. These organisations charge a small annual membership fee but give you access to acres of bedding plants of which the Busy Lizzy is one of the most popular. They will also quite happily grow in full sun or deep shade. Plants get a bit leggy in deep shade and the quantity of impatiens flowers is reduced. Plants in full sun will need more frequent watering, especially when grown in pots. If the pots or soil do dry out your busy lizzies will appear deflated. This is rarely fatal if the time lapsed between them deflating and you noticing is not too great.The plants will soon pump up again after a good soaking. Impatiens plants appreciate a rich soil for luxuriant growth. I used to walk past the front garden of an old gentleman who for years, planted his front garden in the same way. Each year he would plant his busy lizzies, the regulation distance apart, in poor garden soil. They were in good filtered light and regularly watered. The plants just sat there all summer, the flower bed looking pretty much the same at the end as it had done in the beginning. 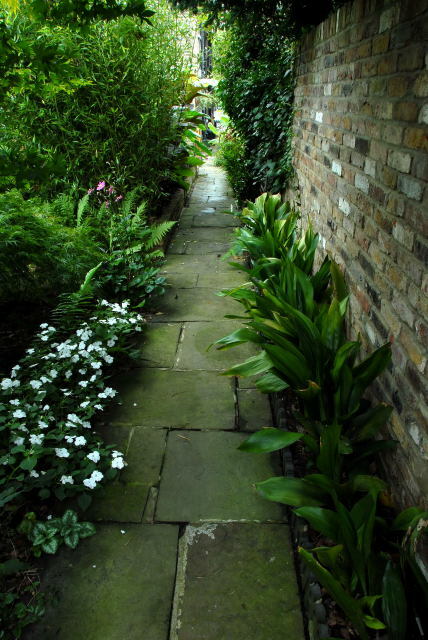 The impatiens flowers growing along the edge of this shady pathway received no direct sun, growing as they were, under a mixed canopy of an Acer, the neighbours over-hanging Yew and an overzealous clematis. They also required regular watering as the canopy diverted most of the rain away. The Aspidistra's on the right only ever receive watering when off on holiday and a softy comes to water the garden. One of the best attributes (along with non-stop flowering) of the impatiens plant is its ability to self tier. Plants placed at the front of the border remain compact with plants behind growing just tall enough to see over the top. 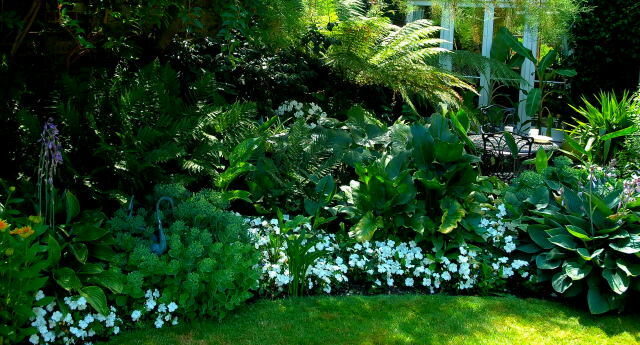 This habit results in an even transition from edge of the lawn up into taller foliage. The picture above shows some seed raised red impatiens who have wriggled themselves nicely into all the available space. This part of the garden receives a good blast of afternoon sun (when available). Pulling the camera back slightly reveals a group of New Guinea impatiens flowers to the right in front of the purple leaved Stroblianthes. 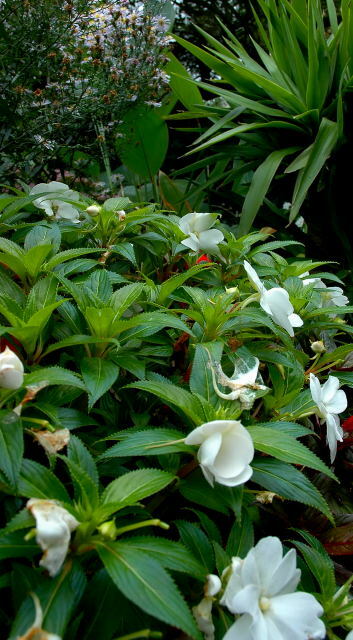 There are two varieties of Impatiens that are of interest to the cool climate tropical gardener. The bog standard Busy Lizzy (which has featured in all the pictures so far), of which there are many variants created by plant breeders. These are principally known for their perpetual flowering. The New Guinea impatiens. These also flower in profusion, though slightly less so, but have a bit more of a body to whistle at. These are the best variety for carpeting. They produce and abundance of impatiens flowers but individually plants are not that much to look at . They are easy from seeds and inexpensive to purchase. Having a few trays of these plants in reserve can often help to give the finishing touch to your current garden display by filling awkward, front of border gaps. The New Guinea impatiens is slightly less of a flowering obsessive. They grow a little taller than the regular Busys and have a far superior foliage. Traditionally these were sold as plants of a reasonable size that would sit nicely in largish containers. The new season plants are always a bit pricey but as more come on to the market the price drops a little. In recent years, tip cuttings of New Guinea impatiens have become more widely available in bedding packs, although normally these do not make an appearance until late May/early June. They are still not cheap but make mass plantings more affordable. 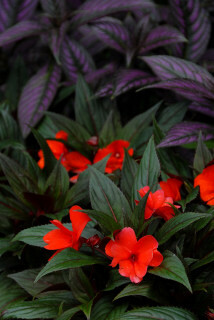 The picture above shows the foliage of New Guinea impatiens. The picture to the right shows the same plants newly panted at at a distance of approximately 4-5 inches (10-12cms.). This is also an acceptable distance for the standard Busy Lizzy spacing. Below to the right are the same plants in flower. 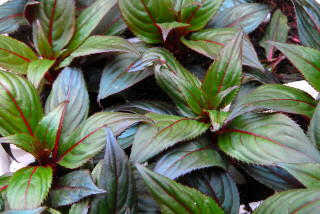 The New Guinea variety are a good choice for containers in a shady patio. They will produce a constant stream of flowers without overpowering the foliage. 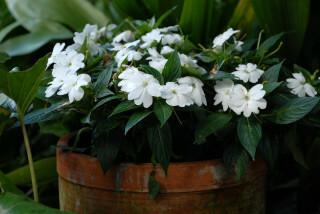 White impatiens flowers are particularly nice in a shady area dominated by green foliage. Shade grown container specimens can last for a considerable time without watering compared to plants grown in full sun allowing for stress-free weekend (or longer) breaks. Anyway there are so many better plants for container growing in a full sun situation. Impatiens grow easily from seeds. The seeds are small so care should be taken. Sow the seeds uncovered in trays of multi-purpose compost and place in a warm, light place to germinate. (The brown speck on the leaf of the plant in the middle at the top of the picture is a spent seed case). Once germinated, Impatiens seedlings grow reasonably fast. They are best used for finishing touches to your display and as such do not need to be in peak flowering mode by the first of May. 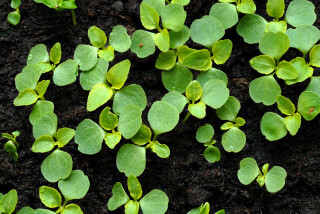 Sowing Mid-March will give you ample time to produce workable sized plants by mid May. Greenhouse grown plants will yield the best results producing compact plants. Windowsill grown plants are liable to be rather leggy. 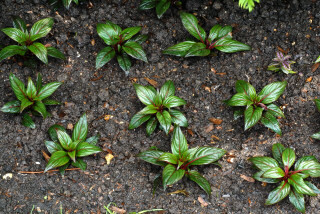 You can follow the progress of these particular impatiens seedlings through the process of pricking out here. When the availability of single coloured impatiens flowers is unreliable, it is best to grow your impatiens from seed. This removes the anxiety of tracking down a single colour when the local shops are not obliging. If however you have a reliable source of single coloured Busy Lizzies it is debatable whether it is worth the effort to raise them from seed yourself. This is not because it is remotely difficult but rather a matter of frost free space allocation. You need to consider if it is worth tying up valuable space in the greenhouse with a low value, easily obtained plant. New Guinea impatiens seeds are more widely available than they used to be but grow slower than standard Busy Lizzy. So other than for personal gratification it is simpler to buy ready made plants. Collecting seeds from your own plants is possible although the New Guinea varieties seldom produce any. If you stuck to one colour then your seeds should produce plants with the same coloured impatiens flowers next season. The picture here show a seed pod approaching maturity. It will continue to swell until almost spherical. At this point the slightest contact will cause the pod to explode. In order to collect your impatiens seeds you will need to encompass the seed pod with your entire hand (as if you were trying to catch a small non-biting insect). The pod will then explode within your grasp, releasing the seeds. These seeds are usually a little damp and are best dried on a sheet of kitchen roll before storage. Regular inspections of the pods are necessary in order to collect the maximum amount of seeds. At seasons end you may be tempted to take stem cuttings of your New Guinea impatiens. This is a very easy process. Simply prepare a stem cutting as outlined here and place the prepared stem in a glass of water. Keep the glass in a warm bright position and the roots will begin to appear in no time. Once again though it is your over-wintering space considerations that need to be taken into account. Something else to think about is that your New Guineas cuttings will not appreciate a long dark winter in cool but frost free greenhouse. They may well look pretty rough by spring in comparison to plants raised in commercial hot houses.